Have you been shying away from smiling or laughing as a result of misshapen, crooked or chipped teeth? The solution to your problem lies in a cosmetic dental treatment known as veneers. Jacksonville based, our office provides the various benefits offered by veneers, you can face the world with a stunning smile and increased self-confidence. Veneers are slim pieces of long lasting, tooth shaped porcelain or ceramic that are individually designed in terms of shape and color by a professional dental laboratory. Dentists bond them in front of patients' teeth. As a result, patients are given an amazing and beautiful smile. Veneers have the ability to totally change the shape of teeth and the smile of a patient. In many occasions, veneers are used as alternatives to crowns and as treatments to numerous other dental conditions. Even though veneers are similar to other dental restorations, veneers can be as natural looking as you desire, and they are known to be extremely durable. Veneers are used to treat patients with a variety of dental conditions and situations. In the hands of expert dentists, porcelain and ceramic veneers can give a patient an aesthetically pleasing smile supported by beautiful, white and regular teeth. They can also be used to help patients with crooked, chipped, misshapen, discolored, or stained teeth. Moreover, veneers can replace teeth that may be too small or too large, as well as uneven spacing of the teeth. If you decide to get veneers, you will be required to visit the dentist twice. In the first visit, your teeth will be prepared to accommodate the thickness of the veneer. Thereafter, a mold or impression of the teeth will be taken. The required color will then be chosen by you and the dentist. During the second visit, following a teeth cleansing with special liquids, bonding cement will be placed between the tooth and veneer. Then a special light beam will be used to harden and the set the bond in place. The durability of your veneers will primarily be in the care you give them. So brush and floss well! Porcelain veneers provide patients with a timely option for treating a variety of dental imperfections. If your smile suffers from crooked, chipped, misaligned, discolored or stained teeth, and/or you want to avoid wearing corrective braces, Dr. Eric Burgess can create custom dental restorations individually fitted to correct each tooth. Unlike composites or bonding, these porcelain veneers provide a more natural surface for your teeth that resists stains and will not discolor over time. Once you have opted for ceramic veneers, you will be required to visit us twice. During your first visit, our technicians will make a dental mold that provides an impression of your teeth, and Dr. Burgess will carefully select the most appropriate tooth color for the ceramic veneers. Each tooth will also be prepared to accommodate the specific thickness of your porcelain veneers. To complete your initial visit, the doctor will attach a set of temporary veneers that are lightly bonded to the freshly prepped teeth. 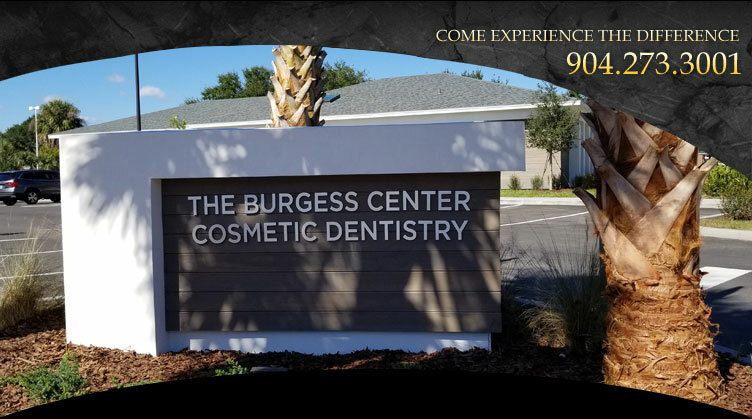 At the second visit to the Burgess Center of Cosmetic Dentistry, the doctor will install your custom ceramic veneers. First, the temporary veneers are removed and the teeth are thoroughly cleansed using a special liquid to prepare the surface of the tooth for a permanent bond. Then, the doctor will carefully place a smooth layer of cement between the prepped tooth and a thin strip of porcelain veneer. A special light is used to flash the tooth and, as the beam penetrates the surface of the veneer, the hardening of the cement is accelerated to instantly set the bond between your existing tooth and the newly crafted porcelain veneer. If you have found yourself shying away from smiling or laughing due to an unsightly dental condition, porcelain veneers may provide the new look that you desire. Since veneers provide a perfectly straightened smile without the long wait of corrective orthodontics, the immediate improvement in the appearance to your teeth can instantly restore your self-confidence. Even though ceramic veneers are similar to other dental restorations, porcelain veneers are much more natural looking. Let our Jacksonville veneers dentist show you how an investment in yourself will help you attain your personal goals. Call (904) 273-3001 today to schedule your consultation.